Home Property Type Billionaire Homes $1 Billion Antilia (Mumbai) – The Worlds Most Expensive House Completed! Whatever you call it, the building is a physical representation of emerging markets taking over the world in terms of money and power, which is also what it screams (money and power) from the top of its 173 meter high walls: an asymmetric stack of glass, steel and tiles with a four-storey hanging garden and solid gold chandeliers hanging from the ball room ceiling. 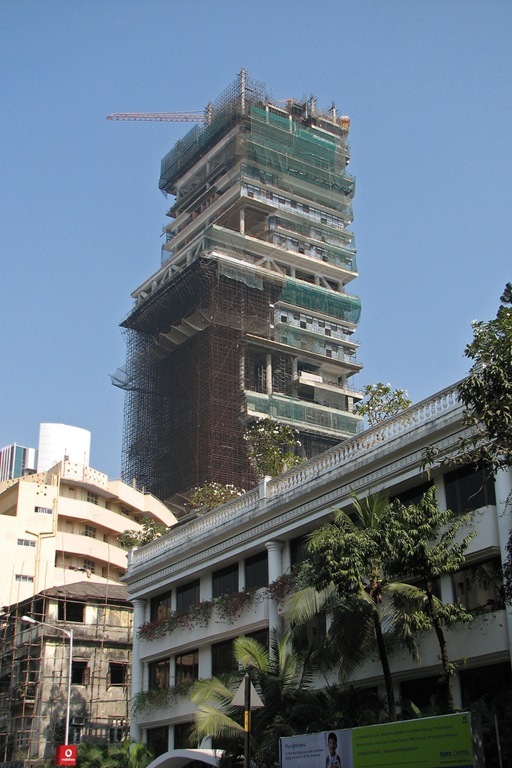 “Antilia is marvellous, I remember a Picasso painting [there], it was one of its kind ” stunning,” one local businessman who visited the building gushed to the Times of India newspaper. As well as having a health club with a gym and dance studio, at least one swimming pool, a ballroom, guestrooms, 9 elevators, a variety of lounges and a 50-seater cinema, the tower also has 3 helipads on the roof, and a parking garage with capacity for 160 cars in the lower floors. The family quarters are understandably on the top floors, where they enjoy an incredible view across Mumbai and the Arabian Sea. Experts say there is no other private property of comparable size and prominence in the world. Ambani, owner of Reliance Industries is worth £18bn according to Forbes magazine. He is not your typical wealthy businessman; in fact he has distanced himself from the Indian business elite. 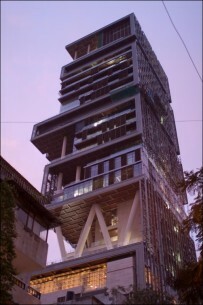 Known as a deeply private man, there is widespread surprise that Ambani has made such a lavish statement of his wealth. 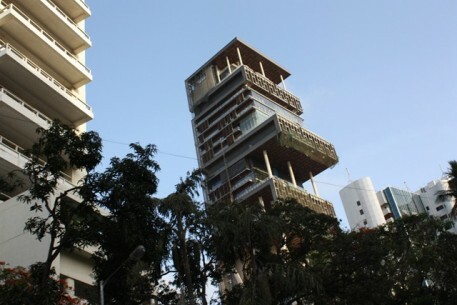 However, the property is thought to have cost an estimated £44m to build, and because of Mumbai’s massive land and property prices, is worth at least £630m, it is a very good investment, perhaps too good to miss — will we now see similar extravagant buildings in the world’s other great emerging cities? On the other hand: “Perhaps he has been stung by his portrayal in the media as an introvert. 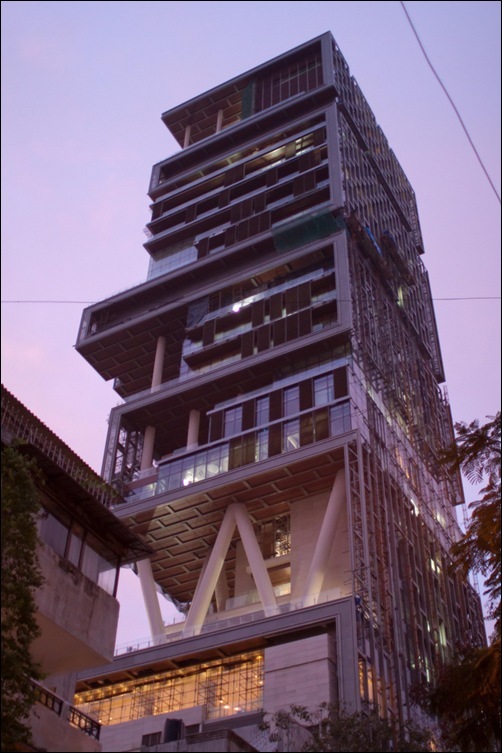 Maybe he is making the point that he is a tycoon in his own right,” said Hamish McDonald, author of Ambani and Sons, a history of the business – India’s biggest privately owned company. Whatever the reason behind it, Antilia is currently the biggest and most impressive family home in the world. 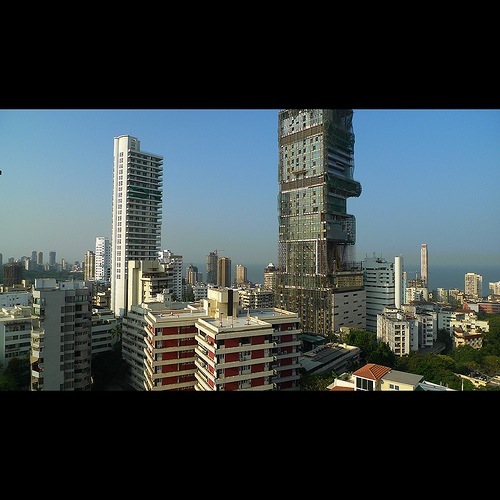 Antilia is located on Altamount Road, Cumballa Hill South Mumbai – a popular high brow area in Mumbia, where land prices start from US$10,000 per square meter. Antilia sits on a 48,780 sq ft (4,532 square metres) plot of land.